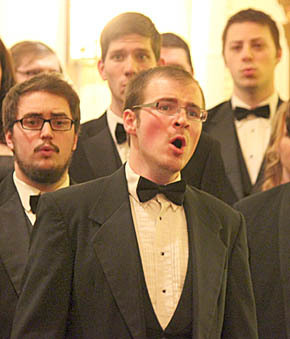 An Albion audience was treated to a wide variety of choral music when the Nebraska Wesleyan Universtiy Choir performed in concert last Friday evening, Jan. 18, at St. Michael’s Church in Albion under the direction of William Wyman. This was the choir’s fifth performance in Albion under sponsorship of the Albion Area Arts Council. About 75 people attended the concert, which was followed by a reception for the choir and audience in the church basement. Albion was the 10th stop on the choir’s regional tour, which included performances in Missouri, Kentucky, Tennessee, Kansas and Nebraska.